The Bloody Mary is an icon in the cocktail world. It is a favorite brunch drink, almost any bartender can mix it up, and it is one of the best hangover cures. In short, few drinks can beat a made-from-scratch Bloody Mary. There are no real secrets to making a great Bloody Mary and it's actually a very simple drink when you break it down. Pour a shot of vodka over ice, fill the glass with tomato juice, then add lemon juice and spices. It comes together quickly or can be prepared and bottled ahead of time. The Bloody Mary is completely adaptable to suit your personal taste. The drink can be as spicy or mild as you like. You can switch out the liquor or skip it all together and enjoy a Virgin Mary. It's really no wonder that this popular cocktail has inspired countless tomato drinks over the years. Stir well. If you feel like doing a fun mixing technique, try rolling this one. Garnish with a lemon and celery or pickle. The majority of the Bloody Mary is made up of tomato juice. This is the key ingredient to the drink and you will find that the best Bloody Mary is made with a quality tomato juice. If you have an electric juicer, run a few ripe tomatoes through it and enjoy the freshest tomato juice possible. When buying tomato juice, read the label. Choose one that is free from unnecessary additives and is made from fresh ingredients. Skip the cans of tomato juice. It is impossible to keep the juice in those large cans fresh and they tend to be a lower quality juice. A good tomato juice in a bottle with a tight seal will produce more great-tasting Bloody Marys. 'Bloody Mary mixes' are tempting and there are some decent ones available. Again, read the label and avoid any with unnatural ingredients. Also, be aware that you'll likely have to add seasonings anyway. The spice of the Bloody Mary will depend on the hot sauce you choose and how much you add. Tabasco is a favorite, but we encourage you to experiment with different brands, intensities, and flavors. Cholula Chili Garlic is one that comes highly recommended. One thing you must remember with any spicy cocktail is that it is best to start with less and add more to suit your taste. There is no turning back once you have too much spice and it can easily ruin an otherwise great drink. When making cocktails at home, it's easy to skip the garnish. They're often an embellishment that adds little to the drink. There are, however, cocktails that rely on the garnish and the Bloody Mary is one of them (the olives or lemon in the Gin Martini is another). Bloody Marys are often garnished with a celery stalk, but many fans will use either a pickle spear or both. Even if you don't like pickles, you'll find that it can transform the Bloody Mary because the juices are infused into the tomato juice. It adds another dimension that celery simply cannot bring to the drink. You should consider the lemon wedge essential as well. You can use it to squeeze a bit more juice into the drink when needed. Also, rubbing the wedge around the rim of the glass is a nice touch. That hint of lemon perks up your taste buds before each drink. If you truly enjoy a Bloody Mary on a regular basis, consider mixing up a batch and storing it in the refrigerator. Simply skip the vodka and mix all of the other ingredients to your preferred taste. Pour this into a pitcher or bottle with a tight seal and keep it cold. Your pre-made Bloody Mary mix should stay fresh for a week or slightly longer. This is also a nice option for parties, tailgating, or as a quick hangover relief. When it's time for a Bloody Mary, simply pour vodka over ice, add your Bloody Mary mix and any extra seasonings you like, and enjoy! The Bloody Mary is not the only tomato-based cocktail out there. Once you get a taste for this vitamin-packed, flavorful cocktail, you will definitely want more and there is no shortage of recipes to choose from. The first option is to simply switch up the liquor. Vodka is an easy choice, but you'll find that others add an extra layer of flavor. In truth, the original Bloody Mary used gin and the Central Park is a modern recipe that features this with just a hint of vanilla. The Bloody Maria opts for tequila and is a personal favorite. If you have not tried this yet, you're missing out on a true gem. Mezcal works as well and that liquor's smokiness definitely does not get lost in the tomato. The Red Pepper Sangrita Margarita is a fun twist on the Bloody Maria as well. 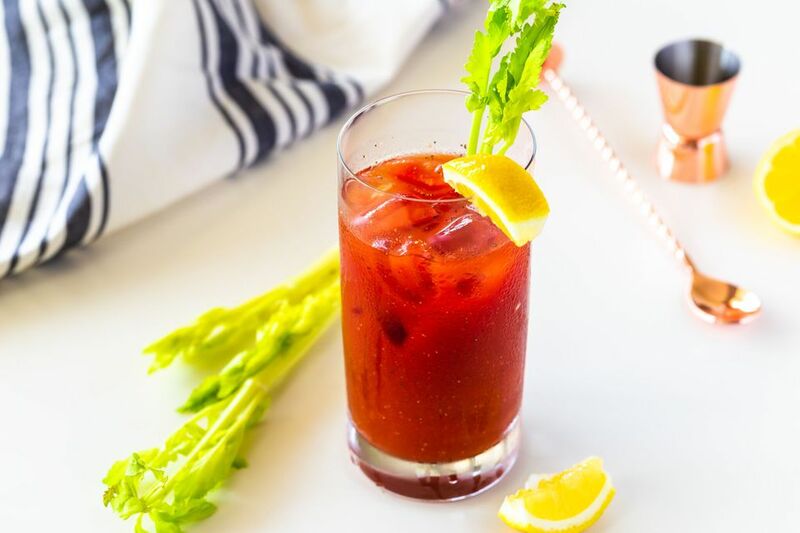 A very popular variation is the Bloody Caesar, which simply uses clamato instead of tomato juice. If you top this drink with a dash of nutmeg, you'll have a Reindeer Caesar. Whiskey is another option for any 'bloody' cocktail and the Forty Creek Caesar is a fun recipe to start off with. As great as all those drinks are, sometimes you simply want a super easy drink. This is where the Red Beer (or Red Eye) can be useful. Just add a little tomato juice to your favorite beer with a pinch of salt and you're done. Of course, you can dress it up with more spices if you like. For a unique twist, you can infuse vodka with tomatoes and enjoy this Tomojito recipe. It's very interesting and muddles juicy cherry tomatoes, adds basil simple syrup, and tops the entire mix with soda. You'll find it to be a bit more refreshing than the average Bloody Mary. On a completely different level, we cannot talk about tomato drinks without mentioning the Sangrita. This is a popular way to take a shot of tequila (or sip it slowly) with a chaser. While the original Mexican Sangrita recipe uses orange juice, the Americanized version opts for a tomato juice base.